Antimatter has now even entered into the public conscience with Angels & Demon’s. It is a bit sad that this movie might scare the public against future antimatter studies … that would be a horrible shame. I contacted you about a year ago about the new cosmologic model that places antimatter and gravitational repulsion as vital and central in forming the Universe viewable today. My writing and outlook have changed quite a bit. The Dominium model has been supported several times by astonishing revelations. For example, the ESA/NASA Jan 09,09 release of data showing the mapping of a giant antimatter cloud surrounding the supermassive black-hole at the center of our galaxy. This surprising story matched a blind conclusion of the Dominium model that in order to be stable/inactive, the supermassive black-hole at our galaxy’s center MUST be surrounded by a cloud of antimatter. Debate has become much more refined as I understand the rules of scientific “e”bate style. I’d love to have you chime in. yes it would be a pity if antimatter became the great bogeyman in public consciousness. I find it frustrating that the price of ‘getting the story out there’ seems to be misinformation, time after time. 1) Does the Steady State Theory or any of its variants allow for Anti-Matter? 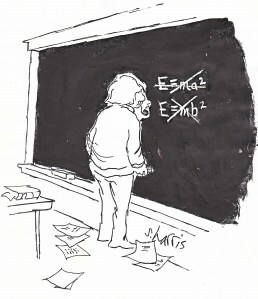 2) What is the significance of Anti-Matter to Quantum Entanglement? The ESA story, http://www.esa.int/esaSC/SEMKTX2MDAF_index_0.html in contrast is a bit more grounded, though in step with traditional rote. The most amazing thing to me is that I never heard of the giant antimatter cloud surrounding the supermassive black-hole at the galactic center until very recently. However, one of the categorical conclusions that the Dominium made early on was the prediction that there MUST be micellular antimatter surrounding and blocking the gate interface mouth of the monster at the galactic center. This conclusion is central to the entire model. Because I had never heard of any celestial large accumulations of antimatter, I always felt that this prediction was the weakest part of the entire model. When I came across the NASA and ESA articles this winter I almost fainted!!! Not only was the prediction of the necessary existence of a micellular antimatter cloud (MAC) surrounding the galactic center not the weakest part of my whole model… but it became the strongest by its validation. Re steady-state, I think the theory does predict antimatter, just as the BB model does. However, the steady state model has been pretty much knocked out by the fact that observations show that our universe is now very different now from what it was in the past. Re antimatter and quantum entanglement, I’m not aware of any connection – except that antiparticles can be entangled just as ordinary particles are..
first off I’m not a physicist so my knowledge is floating on the surface and not too deep. My interest in the general idea of the Steady State Theory rather than its complete model comes from something I heard Michio Kaku say about ‘big bangs’ continually occuring in a sea of nothingness. So maybe how the Perfect Cosmological Principal is described is wrong, but does that mean that Standard Cosmological Model is correct? Reading about the conservation law in Richard Feynman’s book ‘six easy pieces’ made me think that surely the universe could operate on a similar principal with regards to ‘beginnings and endings’..as in there isn’t any. turning to quantum entanglement, I suppose what I was getting at was that perhaps there could be a ‘cross entanglement’ if matter and anti-matter are twinned then surely all the matter we perceive could be entangled directly with all the anti-matter, with a corresponding anti-matter mirror ‘universe’ looking for what they would call ‘anti-matter’ which would be normal matter to us. I use that as a metaphor rather than a physical model but I would say this idea of nested loops will be important to physics, even the fact that the shape of the LHC is itself a loop should tell us something. To borrow a concept from biology “structure and function are intimately connected” perhaps we are creating a macro equivalent of a sub quantum process in order to realize it?? What do you think Cormac? I know you are addressing Cormac, but may I be bold enough to insert the position of the Dominium. You will be glad to hear that this modern deductive analysis aligns with the concept you first read about from Michio Kaku and then saw compatible to Feynman. I’m not sure what you meant by “So maybe how the Perfect Cosmological Principal is described is wrong, but does that mean that Standard Cosmological Model is correct?” If you elaborate. As far as your musings about the possibility of mirror antimatter universes… well, you’re on your way the understanding the Dominium. However, the new model does not suggest mirror Universes, rather mirror galaxies. (Which is conceptually virtually the same thing, though the scales are altered. As far as antimatter hiding in the space between atoms–that notion is clinically disproven, many times over. We have much experience with antimatter in the lab. We might not know everything about it yet… but we know many things it is not. It is definitely condusive to hide within preexisting matter. just cause the steady state theory has flaws does that have to mean that some variation of it could not be true and because it has those flaws does that make the big bang theory correct? thats what I was saying there. haha I gotta stop here and actually learn some real physics not my own brand!!! I agree with you that the steady state idea of an infinite number of Big Bangs sequenced like a string of pearls forward and back over time is a very compelling argument and could fit in with any number of different models. I also agree that the notion of secret hiding places that are there, but not there, is not supported by any physical evidence. Such a scenario sounds more like a fallacious djinni-constructt designed to magically fix a paradox without ever addressing either the parameter or underlying actual dynamics. Though at the same time, don’t shame yourself into only thinking as the herd has always thought. Many questions are yet to be solved. The reason that they remain unsolved is because folks haven’t asked the right questions yet. Hi Rebecca, the city is Geneva in Switzerland, and the tunnel lies 100 m below; it is actually a ring 27 km long that goes right under the Franco-Swiss border. In the tunnel is the Large Hadron Collider (LHC), the world’s largest particle accelerator, run by CERN, the European Centre for Particle Physics. What a particle accelerator does is to accelerate tiny bits of matter to extremely high speeds, and slam them together. Out of the energy of collision, new, even smaller particles are created, some of positive electric charge and some negative (matter and antimatter).